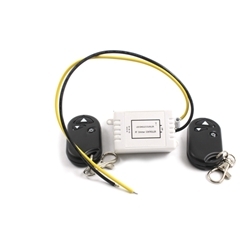 Remote controlled dimmer and On/Off functions. Dim LED lights from 100% to 0% without flicker and noise. 30 seconds cycle time to go from 0 to 100. Safe low voltage system. NOTE: Cannot dim bulbs with high power LED drivers. Works well with CYRON models: SCR1, SCRZ1, SCR3, SCRX3, SCPB152, FL30, CV6 and many other solid color devices operating at 12VDC.